I hope you've had a good first week of spring. It's felt more like winter here, but that seems to be the way this year wants to play it. This year also seems to be rehashing old patterns for myself and others. One pattern that constantly cycles in for me is the superhero complex. What is the superhero complex? I'm glad you asked. The superhero complex is the belief that you must help or save all the people in your life. Yes you didn't make their choices for them, but you can't just let them suffer can you? You must thrust yourself into the depths of everyone's drama to save them from themselves. Sounds like fun doesn't it? The superhero complex is different then simply being helpful. It is proactive in nature scanning for problems and preventing consequences before they even hit a person. This pattern puts you constantly on guard for everyone in your social circle. This includes but isn't limited to: family, friends, co workers, students, clients and random acquaintances. You can see what the problem here is right off with that list. This pattern is an extremely exhausting one to run all the time. You will constantly be pulled from one life crisis to the next with no time to just chill. It not only eats up your time but it also drains your mental focus for your own life. We really only have so much attention and energy to devote to challenges. So while you've been donning your cape to rescue all the people around you chances are that your life goals are not moving along. You can't be the hero in your own story if you are the hero in everyone else's story. You end up being a supporting character in your own life. This pattern is seductive because on the surface you look like the good guy. Well let's dig a little deeper to see why you are putting on lycra and boots. What would happen if you didn't leap to action when the bat signal blazed across the heavens? Your first thought might be well _____ wouldn't be able to cope and their life would be ruined. Can you see how egotistical that is? You are basically saying that no one but you has the answers. The people in your circle need you without you they'd be lost hopeless individuals. You bring light and meaning into their otherwise dark depressing lives. So there is the possibility that maybe that selfless act you just performed for your best friend was not so much selfless as self absorbed. You are the "best" friend in the universe. The cool one, the nice one, the most awesomest guy(or girl) in the world!!! Nope not ego driven at all. Now that is not all of the reasons why we help people sometimes we do it because we want people to like us. We figure if they need us they won't leave us. Sorry to note according to social psychology research this is untrue as the people who routinely give more in a relationship often value it more than the people receiving. So poor self esteem that leads us to go above and beyond the call of duty to our loved ones actually doesn't make us any more secure in our relationships and in fact can make us less secure. Now you might just be saying wait back up just a bit I am not doing this for attention, and I don't feel insecure in my relationships (really never ever?). I rescue people because I like the feeling of helping others. Fair enough I sympathize. I get a good rush out of it too (just like any addict), but are you really helping people when you rush off to "save them". If we save people from their own messes all the time they just continue to create more messes. The burnt hand teaches best. When we make it our job to worry over someone else's choices we are setting ourselves and everybody else up for misery. We keep others from growing and we keep ourselves locked into a struggle for control of the world. Maybe it's time to be Clark Kent to the world and Superman for our own challenges. So how about you? Do you spend your nights prowling the dangerous streets of your social circle's life issues? Do you spend all your energy running around putting out the fires of your friends and family? Are you putting safety labels on life? Maybe you should hang up the cape, take a nap. Ignore the bat signal in your mental sky and allow others the opportunity to step up and become their own heroes. That doesn't mean you can't lend a hand from time to time just make sure there are no ego strings attached beyond the strings of love. Happy Spring! I've had a beautiful day here with sun and blue skies. 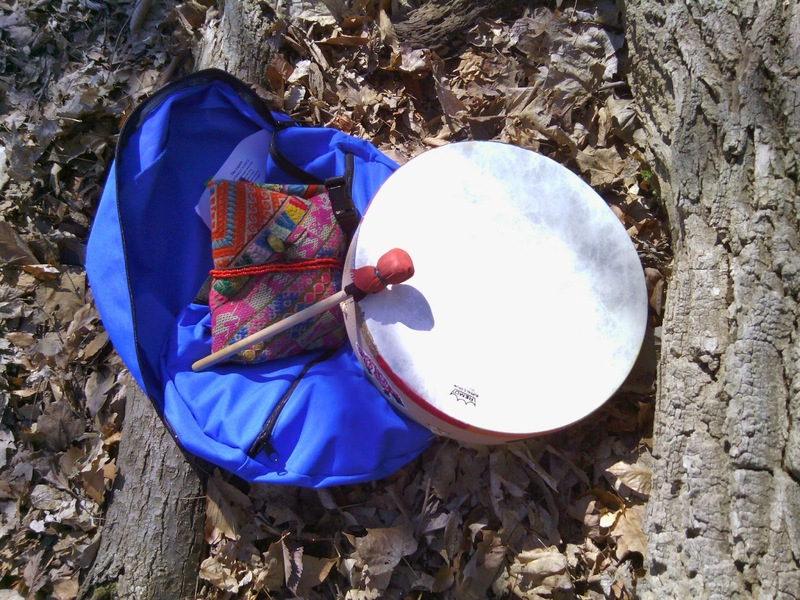 Today was the equinox and that means I was outside drumming for my community and my clients. On the solstices I seem to gather in a group to drum on the equinoxes I tend to drum alone. I like the balance. Each quarter of the year is begun with ceremony and it is always different because we are different. We are never the same as we once were. That is a source of both great sorrow and joy. We cannot ever be as we were. We should see it both ways for there is value in our tears as well as our laughter. As we come into spring we tend to laugh more, quicken our step, reach out with ourselves. It is natural after the retreat into the self that winter often brings. So I set off to the park in the early afternoon. I got out and walked down a footpath and then slightly off the trail. When I drum in public I like to have at least the illusion of privacy for ceremony. I came to a fallen tree with a hollow and thought, "This is the place." So I rattled to clear the space and then I opened with the drum in the east since that is the direction associated with spring. As I began to call in the directions the wind started to blow. I began to drum to my mesa calling on my teachers and honoring them, my power animals, helping spirits, my community of healers, my family, and my clients in the Year of Transformation. Then I began to sing to the trees for their blessings, the nature spirits, the Earth mother, and the Creator. As I continued to drum and sing the words would come to me spontaneously. I don't plan on what to say I let it arise. What arose today continually was the word awaken. Waking our hearts and our spirits from their slumber apparently is the theme of this coming season. Awakening like memory is a double edged sword. Sometimes it is a rude awakening to harsh facts, other times it is gentle stirring of our untapped potential. Which ever it is it tends to be call to greater freedom. Ask yourself what is asleep in you? What stirs deep in the slumber of everyday awareness? Is the dream you are in worthy of you? What new life wakens to find its way through you? As we awaken we become more able to change our course. I hope you have a peaceful awakening and start this season rested and in good standing. Hope you are adjusting to the time change alright. I can tell you that this week has been quite challenging. I'm hungry and sleepy at all the wrong times. What a difference a misplaced hour can be. It even disrupted one of my weekly phone conferences with friends. Every week we meet over the phone to set intentions for our world and each other. This week was the second time we'd met on a new night. After almost five years of a particular time we'd moved it to accommodate new schedules. Factor that in with the time change and we were all discombobulated. So I ended up talking with one of my friends later in the evening and discussing working on the self. Both of us play with energy and possibilities. I mentioned that although I work quite a bit in the field of possibilities and shifts for others with great results, my success with myself has been sporadic. At least in the way of instantaneous shifts. I asked why is it so hard to work on myself when I can do so much for my clients. My friend quoted a rule back to me that many people in the magical paths have either encountered or been taught formally. "You can't use magic for personal gain." On the surface that seems like a good rule right? Makes it so practitioners can't cheat someone or get an unfair advantage. (Unfortunately sorcerers tend to disregard this rule entirely). The only problem is that personal gain is a very nebulous term. Spiritual growth is a personal gain, so is personal healing. Would we consider these bad? Some of this comes out of old religious programming and its proscription against magic in general. There are reasons why those proscriptions existed. Yes there are risks, yes there are unsavory people, and there are always unforeseen consequences (or side benefits if you did a good job). This rule against personal gain helps us feel like we're being good little wizards. That if we're not benefitting then maybe it isn't so bad to go against those old subconscious programs. Still this rule also holds us back from achieving our dreams either with traditional magic, or self help techniques. Together my friend and I came up with a new rule to replace the old one and it is as follows, "Magic cannot be used for soley egoic gain." This still is somewhat limiting but perhaps it is the training wheels to not having a rule at all. The ego while lovely to chat with is only a part of us. This rule ensures that whatever we're trying to achieve is not just a whim of the ego to make it feel more special. If it is something that will bring us into better balance and greater overall joy and ease in our spirit then let the spells fly. If not then perhaps we should take a step back and look at the bigger picture. So how about you? Do you have some outdated rule about how you can or can't help yourself out? What's that about? Are you afraid if you manifest what you want that you'll be bad? Are you letting your ego's need to be viewed as a good deserving person get in the way of your heart's deepest dreams? What if you crafted a new rule? What if you threw out the rulebook? There is a line from an episode of Doctor Who that has stuck with me. A villain says to the Doctor, "The anger of a good man isn't a problem. Good men have too many rules." To which the Doctor responds, "Good men don't have rules, good men don't need rules." Maybe you could take a page out of the Doctor's rulebook and decide that there are no rules. Let me know how that works. So in the past week I started reading some books by Carlos Castaneda at the suggestion of a friend who had some very out there experiences while reading them. I had read one book by him 20 years ago but hadn't really touched his work till now. I needed something to change the focus I had been developing. Just like everyone else I can become fixated in the "real world" forgetting how fluid reality is. The mainstream with all the movies, television, and internet can really take your psyche on a ride very quickly. The world is a lot more changeable and magical than the mainstream would suggest. Change can happen instantly which is why I believe there is a 24 hour news cycle to keep us distracted. Keep people dazzled long enough and you can pull off all sorts of things. I've talked before about the collective dreams and how they bring our world into being. We can also dream our own corner of the world into being. However we can get lost in the tide and eddies of the collective dream if we don't manage our perception well. What do I mean? Well there are wonderful and strange things going on all the time, and most people don't pay any attention to them. Some don't even recognize they happen at all, and for them they actually don't. How is that possible? Well where we focus our attention is where the undifferentiated wave states of the universe collapse into what we consider "solid" reality. If you want to change what your world is like it really is just a shift of where you put your perception. Now the trick to this is that we have a very ingrained habitual mind that we have been feeding with notions about the world since we were children. We have a fairly coherent framework in our heads of what is and what isn't. We can stretch out of this habitual perception but it takes practice to maintain it. We are so bombarded with specially crafted realities by media and societal constructs that we can slip back into the herd mindset of the "world as it is". I've seen this in action. Over the years as I have taken classes in various metaphysical concepts there is a particular effect on reality specifically in the middle of a workshop. Synchronicity increases, miraculous healing occurs, epiphanies are brought to our awareness. This bubble of potentiality carries over for a while, but often as myself and others head back into their everyday lives it fades. Why does this happen? Well without much external reinforcement it is easy to slip into our habitual patterns of perception. Which is why I am reading Carlos Castaneda right now. I needed a little goading to remind myself of all the possibilities outside the habitual modes of perception. You change the lens of your perception and stuff starts to happen very quickly. I'll give you an example, this weekend I was working at my part time job and I discovered a box of pizza hut wings in the cooler. (We have a pizza hut in our shopping area and they sometimes bring unclaimed food to us). A friend of mine loves wings. So I thought I would bring them to her. I texted her "Wings?" and got a "Yes please". Well I went back to the cooler and they were gone. No one else had been near the cooler, they hadn't been eaten, there were no bones in the trash (nor a box for that matter). I tore that cooler apart and found nothing. It was as if they had never existed. In hindsight I figured I had slipped into a parallel universe where there were wings in the cooler and then had slipped right back out again. I've had things like that happen throughout the years. Had I really been thinking I would have used my knowledge to find that other universe with the wings and pop back in. This is why it is imperative to feed alternate ways of looking at the world. It opens you up to more possibilities. Life seems to be full of people ready to tell you why your dream won't work in this world. You can either listen to them and take their lens of perception as truth, or you can turn your attention elsewhere. So how about you? Have you been sucked into (or suckered into) the mainstream's monopoly on reality? What would happen if you started paying more attention to the strange and unusual and less attention to internet memes and television? Are you letting someone else's view of the world dictate yours? Maybe you should unplug for a bit (after you read this blog post of course) take a trip to another paradigm. You don't have to live there but maybe some of the natives have a custom or two you could adopt when you come back.